“Toby” to be introduced to public today. “We are always excited to be able to share new animals with our guests, but this lobster is particularly special,” said Bob Ramin, Chief Development Officer of National Aquarium and Executive Director of National Aquarium, Washington, DC. Just in time for Independence Day, Toby, the rare blue lobster found off the coast of Maryland last month, will go on exhibit at National Aquarium, Washington, DC today. 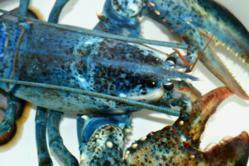 Toby’s particular blue hue is said to be a 1-in-2-million exception to the reddish-brown shade of most lobsters. This unique color is a genetic variation that is caused by the lobster producing an excessive amount of a particular protein. John Gourley and his team aboard the fishing boat, the Pot Luck, caught Toby off the coast of Maryland near Ocean City in June. The lobster had been staying in Martin’s Fish Co.’s lobster tank prior to being donated to the National Aquarium on June 19. Toby was not immediately placed on exhibit due to standard precautionary measures regarding the safety of a new species. Today, Toby will be placed in the recently renovated Stellwagen Bank National Marine Sanctuaries exhibit, which currently houses three black sea bass and one tautog. National Aquarium, Washington, DC is open daily. Now through Sept. 3, National Aquarium, Washington, DC is open until 6 p.m. Sun.-Thu. and until 7 p.m. on Fri. and Sat. National Aquarium inspires conservation of the world’s aquatic treasures. It champions environmental initiatives by engaging with visitors, volunteers, education groups and schools to actively participate in the preservation of the world’s natural resources and living-systems. National Aquarium, in Washington, D.C. and Baltimore, MD, delivers meaningful experiences through its engaging living collections; our science-based education programs and our hands-on experiences in the field from the Chesapeake Bay to Costa Rica; and partnerships and alliances with like-minded organizations around the world.